Greeting Cards 4 Kids use An Post, the Irish postal service, for all our deliveries. All orders will be charged using standard postal rates based on weights. All prices include post and packaging materials. When you add products to your Shopping Basket and then choose your delivery country, the appropriate delivery charge will be added automatically. You will always be able to see this charge before submitting your order. All orders are custom made and most orders will be dispatched within 2 working days of receipt of payment of order (unless otherwise stated in the description of a category page or a product page or when there is a sale or promotion on which increases the normal volume of orders or during the very busy period leading up to Christmas) with the exception of Weekends and Bank Holidays and the busy period leading up to Christmas. 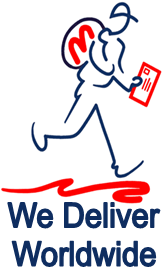 You must ensure that you allow adequate time for your cards to arrive as we use the postal services who can often run behind schedule. You should allow 3 working days for delivery within Ireland, up to 7 working days for UK and up to 10 working days for all other countries from date of dispatch. We will post your card for you but rely on the postal service to deliver your card. Orders are dispatched daily in batches. Therefore if you would like proof of postage for your particular order please reply to your order confirmation email with this request. Greeting Cards 4 Kids shall have no liability to you for any failure to deliver goods you have ordered or any delay in doing so or for any damage or defect to goods delivered that is caused by any event or circumstance beyond its reasonable control, for example, Severe Weather Conditions, Strikes, Natural Disaster, Terrorism or Fire. Should such delays occur, obligations under these terms and conditions will only resume at such a time that the delay has ended. In the unfortunate event that you receive the wrong or damaged goods, please contact us immediately and we will replace them free of charge. If you would prefer a refund we will issue a refund within 7 days. Any refund which is due to a fault or other defect caused by Greeting Cards 4 Kids, will include a refund of the applicable delivery charge. Your rights to return goods are protected under the EU Distance Selling Directive which can be found at http://ec.europa.eu/consumers/cons_int/safe_shop/dist_sell/index_en.htm Should you have a reason to complain you can contact us by going to our contact us page on the website. These terms and conditions do not affect your statutory rights.